With the new grant, SASS is now SCASS, with a new blog. This blog will no longer be active. Our good colleague Davide Zori has a nice article in the Baylor Media Website about his exciting work at Mosfell. Davide just started at Baylor and they do not even have a faculty website up for him yet. There is a funny article about the New Zealand Butchers in Iceland. We stay in the same house in Skagafjörður. This year the team is back for a short summer field season to ask a simple – but important – question: what is the total volume of cultural material accumulated at Viking Age farms in Langholt? 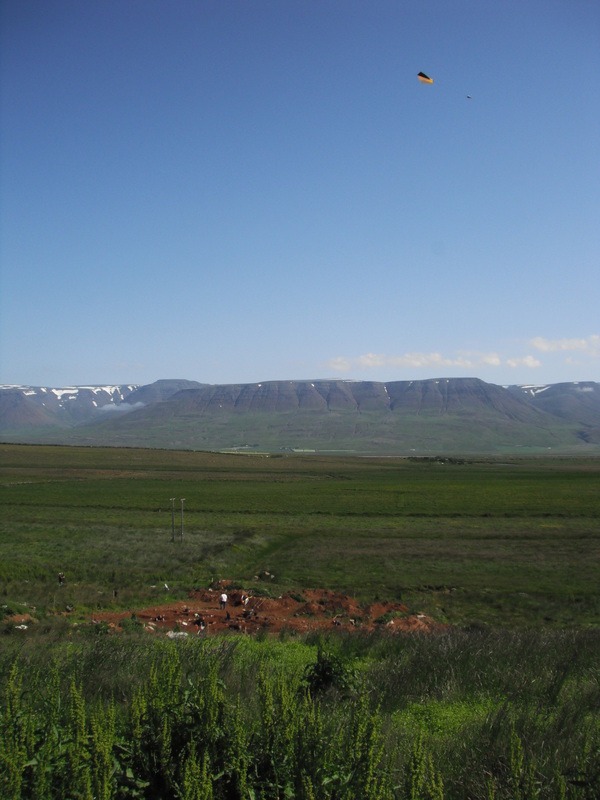 Previous work done by the Skagafjörður Archaeological Settlement Survey (SASS) has determined the areal extent of Viking Age farms, but we still don’t know whether some farms are ‘thicker’ than others, meaning they accumulated more refuse over the same amount of time. If we can estimate the volume of cultural deposits and compare them from farm to farm (and from the Viking Age to the Medieval period), we’ll have a better idea of how the landscape was settled and changed over time throughout the region. Many of the farms in Langholt were occupied from the Viking Age to the 20th century. 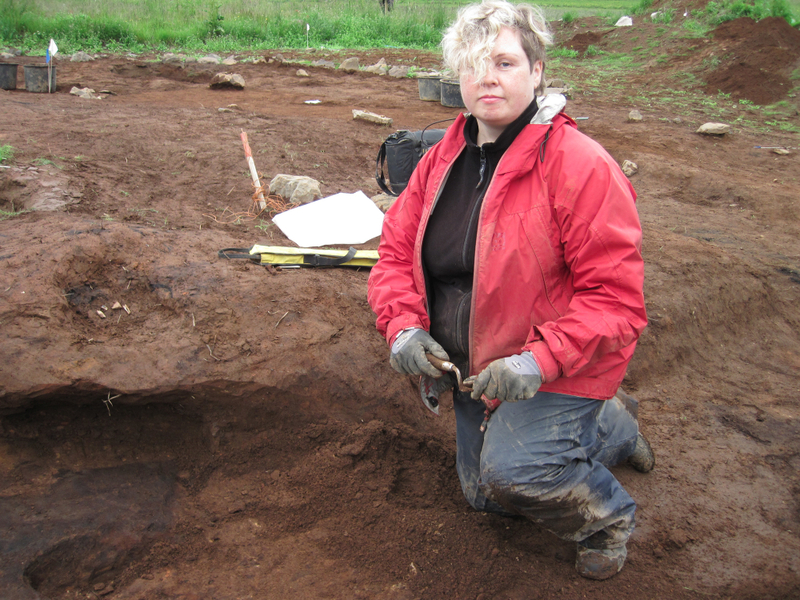 Sometimes the Viking Age farm is buried deep underneath centuries of cultural deposits. 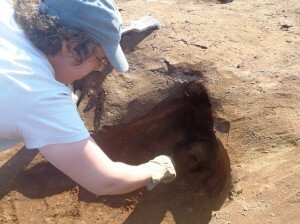 The main types of material we find in farm mounds are architecture and trash: turf and midden. 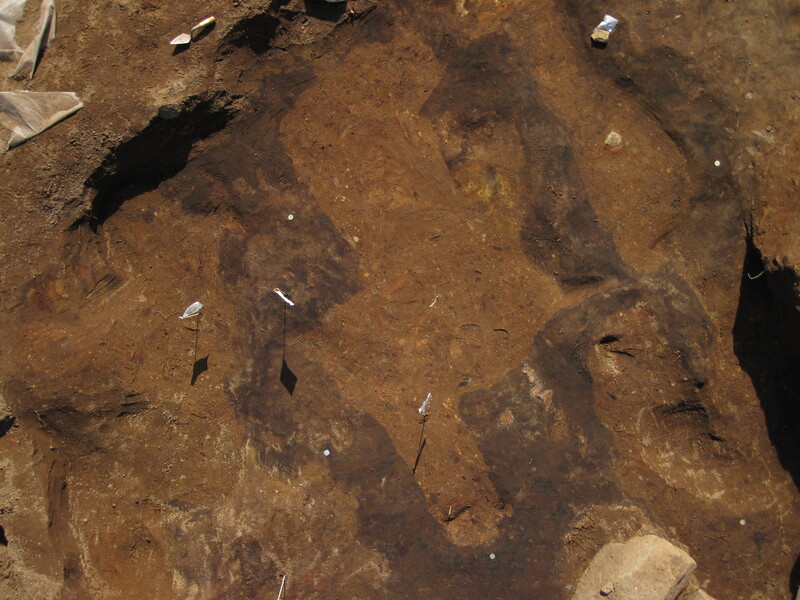 The accumulated material sometimes creates a visible ‘mound’ on the surface – also known as a farm mound. To get information at the bottom of a farm mound, archaeologists have to dig sometimes up to 3 or 4 meters (10 to 13 feet) deep. This summer, the SASS team is using deep coring to efficiently collect basic data about farm mounds with minimal disturbance to the archaeological record. It takes a little elbow grease, but the quality of the data is worth it! 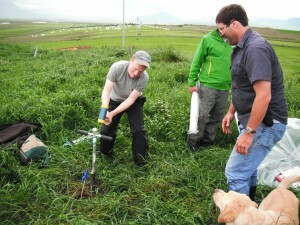 Eric (MA student from UMass Boston) hammering a deep core into the farm mound at Kjartansstaðir. We use tephra layers (ash from volcanic eruptions in Iceland) to helps us date certain deposits. 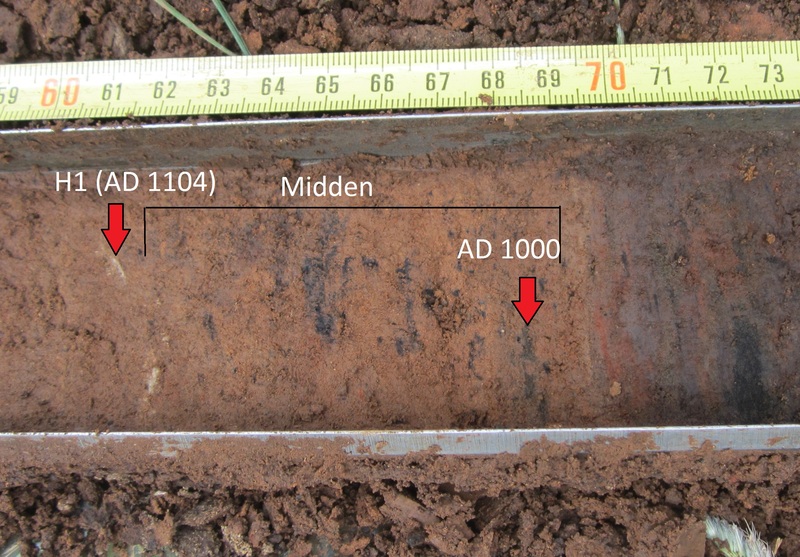 At Kjartansstaðir, for example, underneath 3.5 meters of cultural deposits, we found strips of H1 (dating to AD 1104) and the 1000 layer (dating to around AD 1000) with midden underneath. This gives us a good idea of the depth of the Viking Age farm. Combined with areal extent, we can determine the ‘volume’ of Kjartansstaðir before and after the Viking Age. 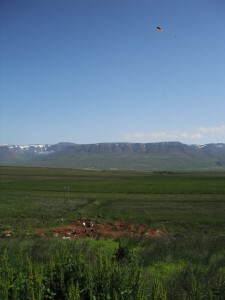 Example of tephra and midden from Kjartansstaðir over 3.5 meters deep. So far things are moving on schedule. 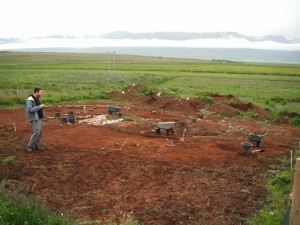 We hope to survey at least 7 farms before the end of the field season. Julie, Eric, and I spent most of today at Stóra-Seyla clearing, photographing, and beginning to excavate several grave cuts to the north of the church. Julie and I put our heads together and got the pole camera running. We got several good, clear shots of the cleaned grave cuts. 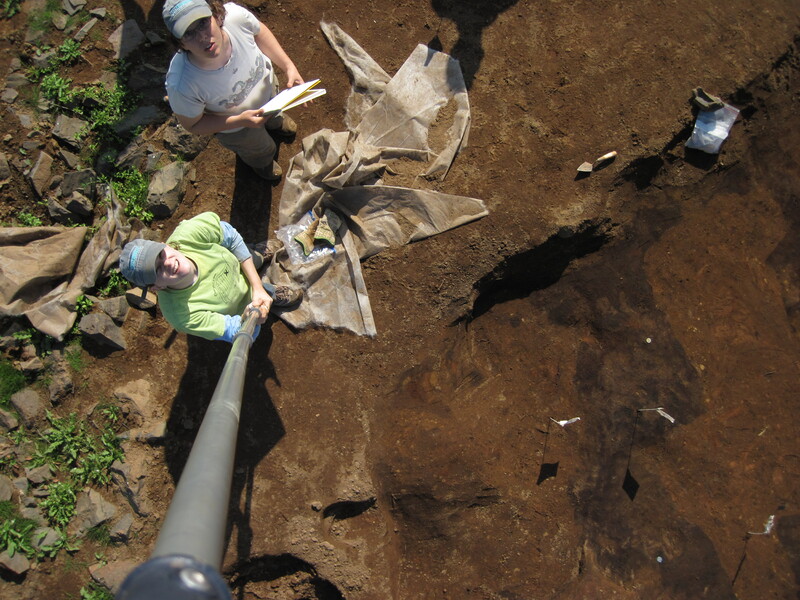 The outlines of the graves – where the gravediggers cut through the earth to bury their dead in 11th century Stóra-Seyla – are extremely clear now that we have opened the area down to the level of the landnám tephra. 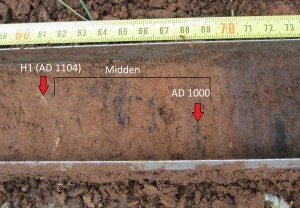 The contrast between the dark-colored tephra and the lighter brown, mottled grave fill makes the interface stand out. These cuts in the tephra are also visible in the ground-penetrating radar results from our 2009 survey. This photo, with southeast at the top, shows the area where we were working. At left are two possibly connected graves that I began to clear just after the photo was taken. Eric traced the outlines of the two connected cuts that show most clearly at center, while Julie worked in the small area at right, in shadow. With lots of guidance from Guðný, the director of archaeology at the museum who has been excavating cemeteries in Skagafjörður for many years, we began to (carefully) excavate. The northernmost of my two cuts revealed a skull late in the afternoon, probably that of a young woman. Women were usually interred to the north of the church, and men to the south. We don’t yet know whether Eric’s area contains human remains. Many of the people buried here were disinterred during the late Viking Age and reburied elsewhere, meaning that many of the graves we are excavating contain only fill. We hope to learn more tomorrow. Meanwhile, John was flying the kite overhead whenever the the winds were right! 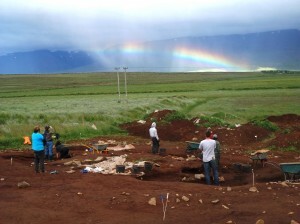 After a long week of digging, most of Stóra-Seyla has been cleaned from last year and progress has been made. Earlier in the week, the team worked on cleaning off the excavation area and taking off the remaining top layers of soil. After removing some soil, Eric uncovered a turf structure, relatively small, to the southwest of the church, right outside the cemetery wall. James and I removed soil that contained the 1104 tephra to the west of the cemetery wall, making sure there were no graves outside the cemetery wall. After no graves were found, we moved to the east of the church, inside the circular wall enclosure, where we removed soil from an area where previous excavators who, when the church was moved up the hill, took most of the individuals in the graves out and moved them into the new cemetery. We have been cleaning off the fill that these previous excavators put back into the holes they dug when they were removing graves and this afternoon after much hard work, we were rewarded with a beautiful rainbow that slowly moved across the landscape as the sun and the rain just matched up in a single spot. It was absolutely beautiful! Clearly we all just had to stop and admire the beautiful sight Mother Nature laid out for us! The NSF website just put up our project abstract. This is the basis for the field season. The abstract is reprinted below. 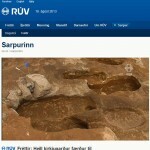 This work is done under permits kindly granted by The Cultural Heritage Agency of Iceland. The EM unit we are using this year is a CMD explorer. We will put up some results when we get a chance. 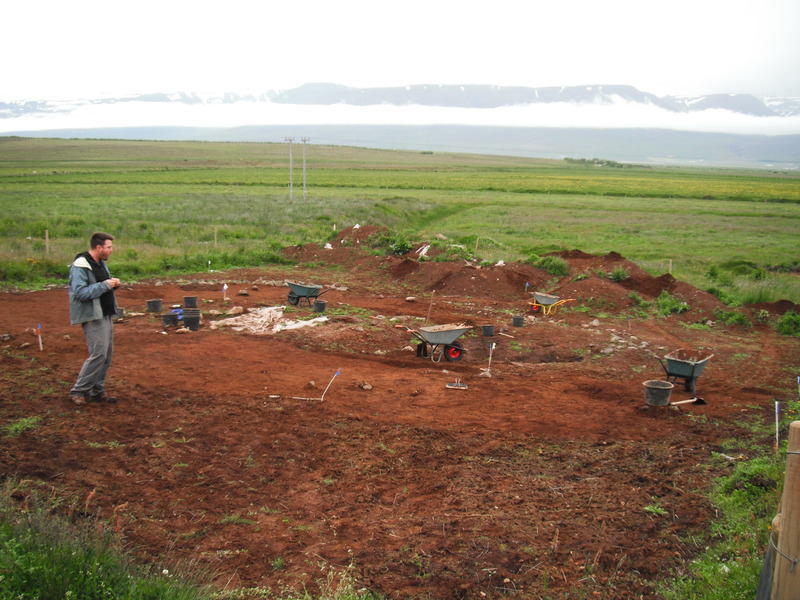 This is an EAGER project to test the reliability of geophysical reconnaissance methods to identify buried Christian churchyards and cemeteries in Iceland. 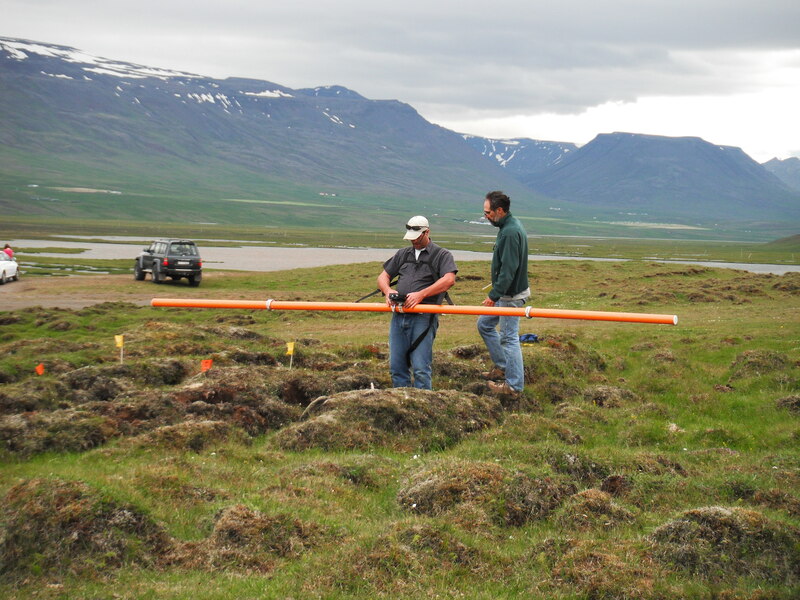 The research will allow the joint Icelandic/US team to evaluate the reliability of two geophysical methods on five known or suspected early Viking Age churchyards that are in a variety of geophysical environments. 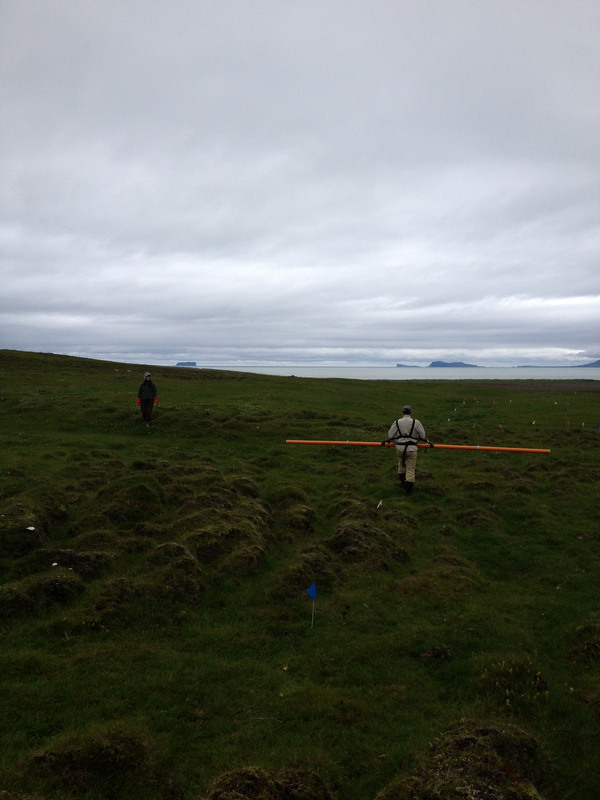 Currently, the most reliable geophysical method to detect Viking Age Christian cemeteries in Iceland is GPR. The problem is that for GPR to be effective, it is necessary to strip off the grass in advance of survey. This is expensive and potentially destructive to archaeological contexts. The team will employ electromagnetic (EM) surveying with new multi-sensor instrumentation as an alternative method for locating preserved walls of churchyards. 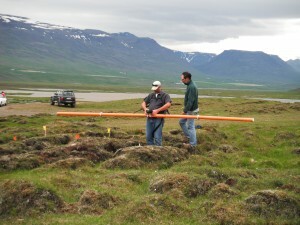 Positive results from this unique opportunity to evaluate these geophysical applications could greatly expand our knowledge of early Christian practices of the Viking Age. 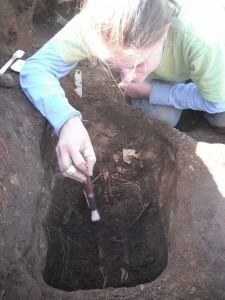 More broadly, many of the innovations, especially in identifying cemeteries and mapping graves, have applications in other archaeological regions and periods, as well as other fields (e.g., forensic sciences). 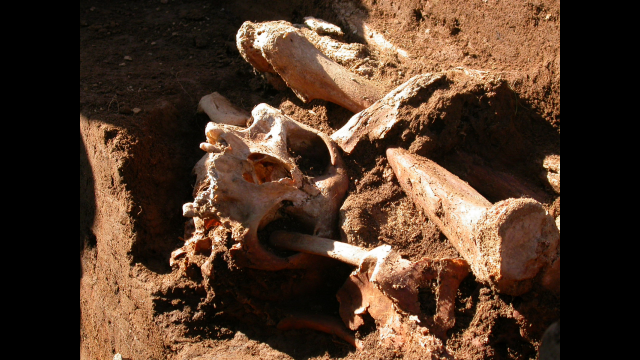 The ability to identify cemeteries and map the distribution graves and possibly to assess skeletal preservation has obvious value to archaeological investigations, heritage management efforts, and forensic scientists around the world. I thought I’d share my first impressions as newcomer to the SCASS (Skagafjörður Church and Settlement Survey) team this year. But first, a little about me. I recently graduated from Northwestern University with a BA in Anthropology. This fall I’ll be a UMass Boston Master’s student starting focusing on Iceland for my thesis. 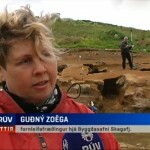 I’m currently getting a feel for Icelandic archaeology (quite literally) before launching into my studies in September. This week has flown by since arriving in Iceland on the 9th of July. After doing some geophysics on Hegranesþing, we headed over to Akureyri for the NABO conference over the weekend. John, Brian and Doug gave a talk on their current and future research. Based on the presentations over the course of two days, the North Atlantic is brimming with exciting research right now, especially with rapidly changing environmental conditions threatening archaeological sites all the way from Greenland to the UK. 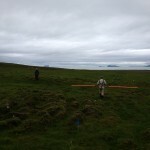 On Monday, one team scouted out some potential Viking Age church sites to prep for geophysics while the rest of us cleaned up the ongoing excavation of the church at Stora-Seyla which began last year. The team has been working with Guðný Zöega and the Skagafjörður Museum the past couple of years, we’re excited to have them as official collaborators this year. Monday night we partook in the yearly ritual of eating hákarl (fermented shark) and Brennivín (Icelandic schnapps). John deemed it “the ideal survival food.” I think most of the Americans agreed it should be reserved only for life or death situations. Today, we continued excavating the church site at Stóra-Seyla, clearing out overburden in new sections and revealing turf walls and grave-cuts. The rain held off for most of the day, but we had to end a little early before we started troweling through straight mud. Looking forward for week 2! Welcome to the SCASS 2013 season! We have a new acronym for a new project: the Skagafjörður Archaeological Settlement Survey is joining with the Skagafjörður Heritage Museum (Byggðasafn Skagfirðinga) to form the Skagafjörður Church And Settlement Survey (SCASS). This year we are here to follow up on last year’s successes at locating Viking Age churches with multi-depth conductivity meters. And starting next week, the crew from UMass Boston will be joining with the museum to continue the church excavation at Stora-Seyla. 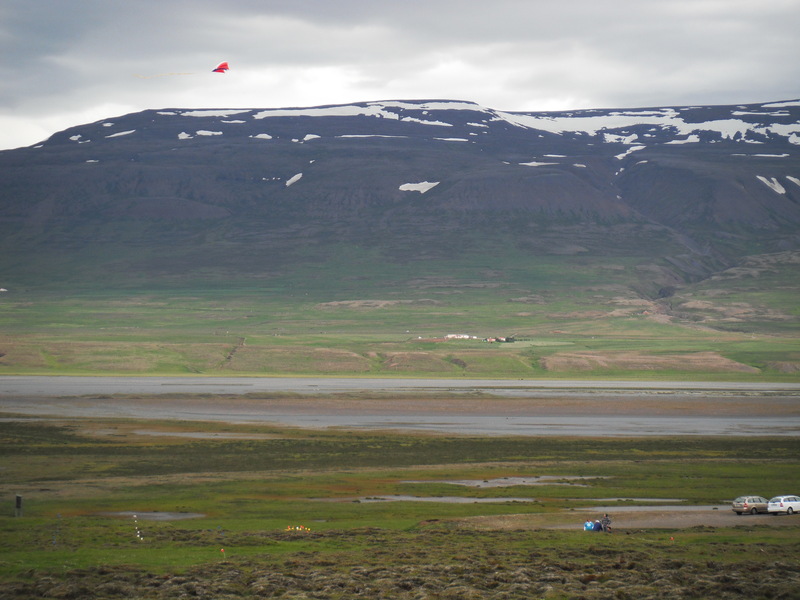 After one day of work we’ve already completed our first geophysical survey of the church at Hegranesþing – including a fantastic set of air photos with the high-wind kite! We have clearly visible churchyard walls in the geophysical results, so things are looking good. 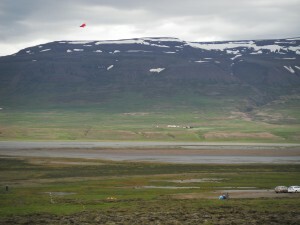 John Schoenfelder flies our high-wind kite over the survey grid at Hegranesþing, which was the Viking Age assembly site for the northern quarter of Iceland. John Steinberg and Brian Damiata wade through þufur with our new instrument, the CMD Explorer – a conductivity meter that takes simultaneous readings at three different depths. This weekend we will be at the NABO conference in Akureyri, where John, Doug, and Brian will be giving a talk and presenting several posters. The last of our crew arrives on Monday and then it’s back to work! Stay tuned – it looks like this will be another fantastic season.